Interracial Jawn is pleased to announce a special Podcast MONDAY Apr 25 at 9:30 PM ET! 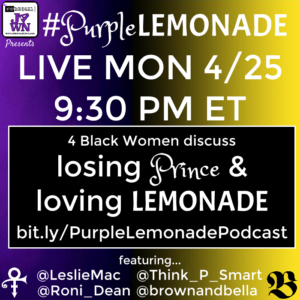 4 Black Women will meet to discuss losing Prince & loving #Lemonade LIVE! Don’t miss this opportunity to get your life with @LeslieMac, @brownandbella, @Roni_Dean & @Think_P_Smart. Click below to be notified & to join us!